I was enamoured by it. Why? Because it represents the world of modern medicine very well. I didn’t take photos of the side exhibits, but they were intriguing too. It is meant to be a ‘playful yet provocative commentary on the world of modern medicine’. 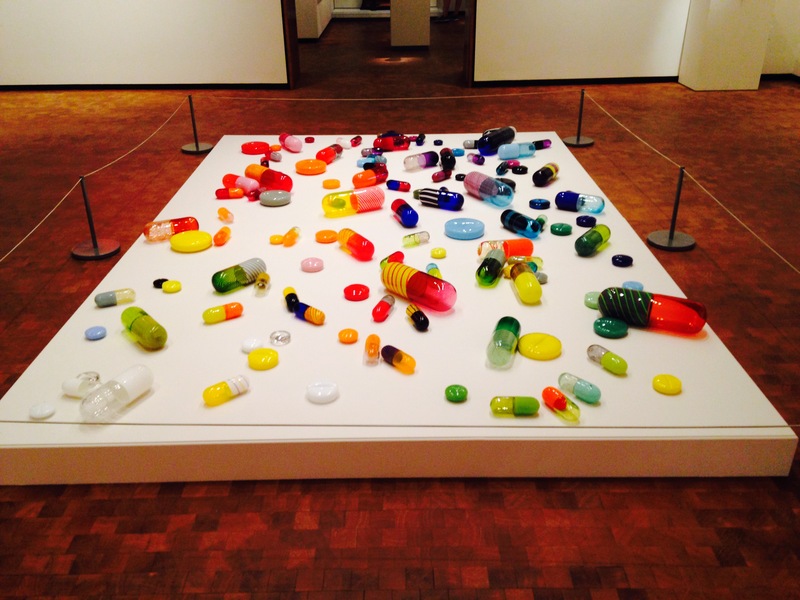 As I looked closer at the glass pills I began to understand what she was trying to represent…the bright colours and bold patterns of the pills are supposed to alert us to the complicated relationship between a $500 BILLION pharmaceutical industry and our yearning for good health. The exaggerated sizes of the pills aim to point towards the excess of the industry with aggressive marketing tactics to promote various medications to the sick AND healthy. I realised as I stood there with my big fat bubbling ovaries weighing me down from all the recent injections that looking into the reflection of these giant glass pills, this was part of ME. $7700 our IVF medication cost for just one round of treatment. (I know we can buy it a whole lot cheaper…I compared it to the cost in the UK). 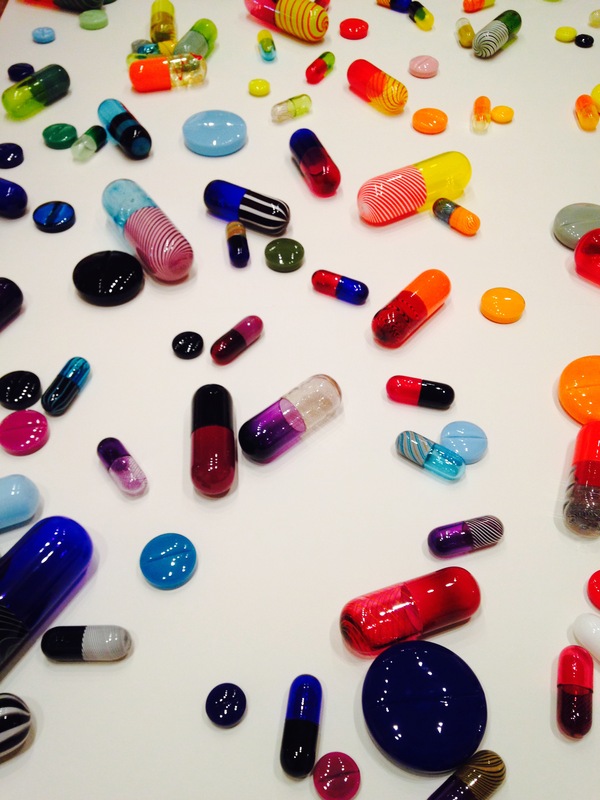 The artist says that when you look in the reflections of certain glass pills you will see a distorted mirroring ‘evoking the complex connections between chemical substances and our own self-awareness’. I want my own biological child THIS much…I am willing to inject and consume $7700 worth of medication despite the fact that I am not actually SICK. But then again, I have a disease, it’s called infertility, I guess that makes me sick officially, I just don’t feel SICK. But the doctors don’t know what is making me SICK and so we are trying everything possible to overcome it. Do I have a distorted view of our situation? I put a lot of trust in the doctors and the medication we are using…I mean have you seen the whole list of disclaimers on those medicines???!!! Here in the US there are lots of adverts for drugs on TV and radio, and they have to legally state what possible side effects are, and sometimes these disclaimers go on for 2 whole minutes usually ending up with – may cause every disease under the sun – oh and don’t forget death. We just don’t have this form of advertising in the UK, so it is odd and I always wonder why anyone would ever take the drugs that are being advertised if there is a chance of death. Some of the drugs I am using are known to increase the risk of various cancers, including ovarian and breast cancer. I am willing to accept those (admittedly teeny tiny) risks to have my own child. But to what extent will I keep doing this – pumping chemicals and hormones into my body? How much is too much? When do we stop? When is enough, enough? Is this culture of chemistry making us healthy or is it creating an ‘Artificial Paradise’? It dawned on me over a week ago that when I go for my work trip & mini day break with mum up to DC tomorrow, I will not have my handy man (AKA hubby) with me to administer the progesterone in oil injection. Uhoh, I worried that I would not be able to do it on my own – have you seen the size of that needle? It’s 3 times the size of the one that is injected into my abdomen!! The first time I tried to inject myself was a complete failure, I froze to the spot. There was little chance of me administering this 1.5″ long needle myself – in my buttocks. I thought I was going to have to cut our trip short, until I realised that my mum could do it!!! Now – my mum is a self admitted needle phobe. Fortunately, she is only a needle phobe from needles being administered to herself. She works in a school and has administered an epi-pen to a child before. The challenge to inject me with this ginormous needle still was not insurmountable. So we got mum into training ASAP. Once Chris had tried administering the injection on me once, he then started training my mum. First night of training – observation. Mum observed Chris and he explained every step he took. Here is a simple 10 step programme. 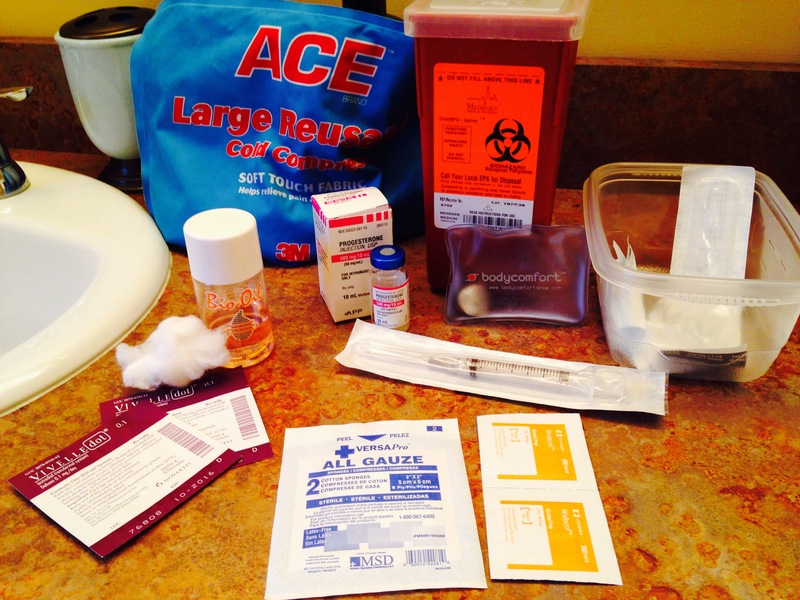 Step 1: Prepare items: 1.5″ 22G needle, progesterone in oil, gauze, x2 alcohol swabs, sharps container, ice pack for numbing, heat pad for massaging afterwards. Step 4: Prepare medication: take lid off progesterone bottle, alcohol swab top, extract 1ml of progesterone using needle, check for air bubbles. Step 7: Pull skin apart at injection site and hold down. Let Dani know you are going to stab her 3-2-1: stab! Step 8: Remove needle and place gauze on injection site & massage. Step 9. Dani continues to massage injection site area with heat pad for about 10 minutes. Second night of training – prepare medicine with Chris’s guidance, observe Chris injecting again. Practice injection using lemon and vegetable oil to get feel of how hard it needs to be ‘darted’ into the skin. 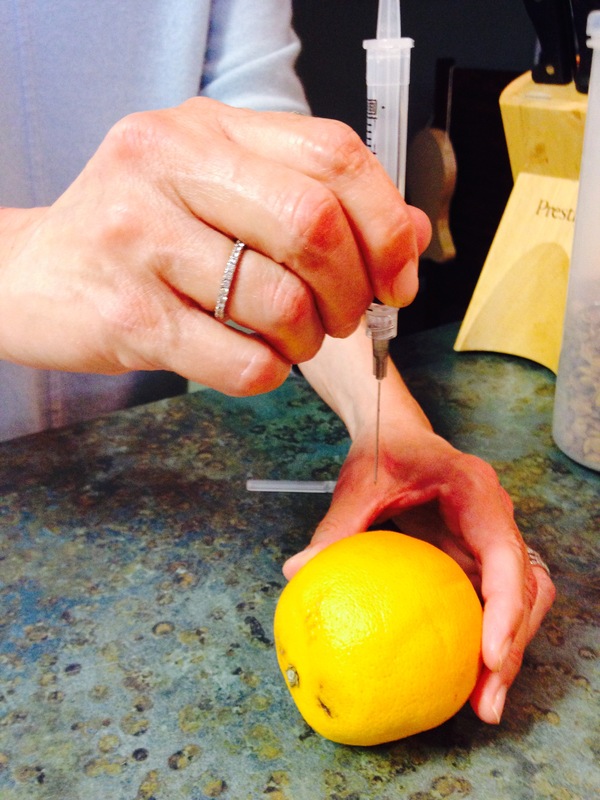 By the way – when life gives you lemons…..stab em with a needle and inject vegetable oil. Waaaaay more fun than making lemonade!!! Third night of training – prepare medicine without Chris’s guidance (Chris observes), Chris injects again while observing. Continue practicing with lemon. Fifth night of training – on own administer everything without Chris’s guidance, Chris observes and only interrupts once to slightly change the grip on the needle. Mum is now fully Qualified! D-Day: She did it!!!! Mum did this all on her own without any help from me at all. I am so grateful and proud of you Mum! I tried practicing with the lemon against on my bottom to see if I could do it my self just in case – and it is possible on my left side, but very difficult on the right side, so despite my needle phobia I would probably still need help to inject on my right side. After Mum qualified and passed her 5 night training plan, she told me that throughout this she has learned that the you can overcome anything for your children. Awwww. Thanks Mum, I love you lots and can’ thank you enough for overcoming your fear to help us out. 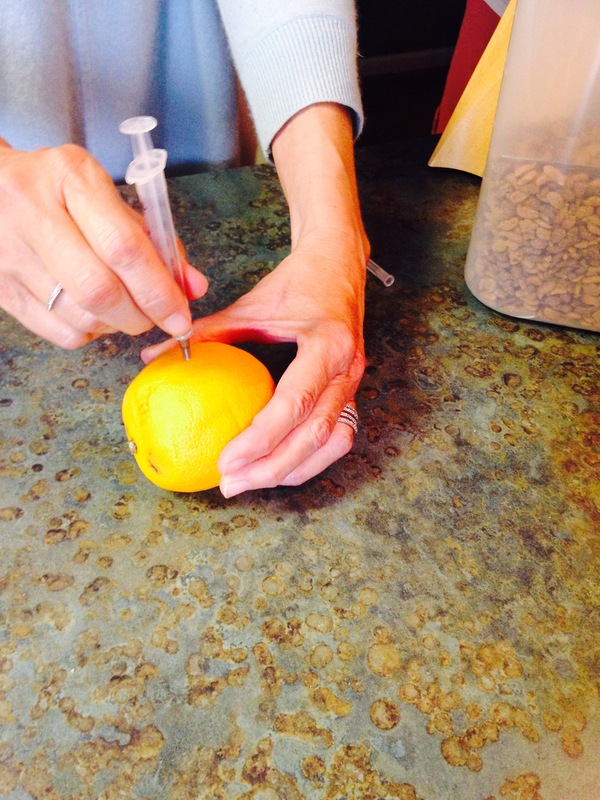 Hormones, hormones, hormones…why am I injecting all these hormones and what do they do?? This is a good question – apart from doing as I am told by the doctor, I thought I should be able to at least answer this question to my friends and family who ask: What does each drug do and why I am taking it? So I am going to have to go back to school with this, I hope I am not patronising. I am sure I could recant all of this from my biology classes if they weren’t almost 20 years ago!!! There are several ways a doctor can choose to stimulate ovaries for IVF treatment, these are called protocols and they can vary in dosage, type and timings. My doctor has chosen the antagonist protocol for me. Back to basics...so let’s take it back to school…there are four major hormones involved in the menstrual cycle: FSH (Follicle-Stimulating Hormone), LH (Luteinizing Hormone), Estrogen and Progesterone. Today I am going to focus only on the first two weeks of the menstrual cycle, also known as the follicular phase. FSH and LH are released from the brain and travel into the blood to the ovaries. These hormones stimulate 15-20 eggs in the ovaries, each in its own “shell”, called a follicle. These hormones (FSH and LH) also trigger an increase in the production of estrogen. As estrogen levels rise, like a switch, it turns off the production of FSH. This careful balance of hormones allows the body to limit the number of follicles that mature to just one. So what does this mean for IVF? The goal of IVF is to produce as many mature eggs as possible to create conditions for the greatest chance of successful conception, to do this doctors use injectible hormones to control this phase of the mentrual cycle and stimulate the growth and maturation of the eggs, ready to be fertilised. So we know that FSH stimulates the growth and number of small follicles, for small follicles FSH is the major survival factor that enables them to develop beyond 5mm in diameter and to avoid apoptosis, i.e. the programmed death of a follicle and egg. In a normal menstrual cycle, multiple small follicles produce inhibin-B to lower FSH levels so that only one follicle will mature. In an IVF cycle, artificially increased FSH overides the inhibin-B levels and therefore allows multiple follicles to grow and mature. This is where the drugs Gonal-F and Menopur come in. Gonal-F is a follitropin alpha medication (also known as a gonadotropin). It is a synthetic version of the naturally-occurring FSH. Where as, Menopur (also a gonadotropin), a combination of both FSH and LH, however unlike Gonal-F, Menopur is natural; it is extracted and purified from the urine of post-menopausal women -ummmm nice. It is believed that a small quantity of LH during ovarian stimulation produces a better result in some patients. It is for this reason that my doctor prescribes a combination of the natural and synthetic combination of gonadotropins, menopur and gonal-f.
As the gonal-F and menopur start to work, we need to make sure ovulation doesn’t occur prematurely, therefore they use the injectible Cetrotide. The active substance in cetrotide is cetrorelix, this blocks the natural hormone LHRH (Lutenising hormone releasing hormone). LHRH controls the production and release of LH which causes ovulation. The cetrotide stops the production of LH, preventing premature ovulation. This allows the doctors to carefully control when ovulation will occur. The trigger injection. The controlled hormonal stimulation I have described so far usually lasts for about 8-12 days, and dosages vary depending on how the woman responds to the drugs. This happens all before another drug is injected – Ovidrel. Ovidrel is the trigger injection containing a synthetic form of the hormone human chorionic gonadotropin – hCG. There are several brand names for the hCG trigger shot including Ovidrel, Profasi, Pregnyl, and Novarel. hCG is known as the pregnancy hormone, but it also happens to be molecularly similar to LH. In a natural cycle, LH triggers ovulation. As part of fertility treatment, an injection of hCG is used to trigger the maturation of eggs. Ovulation usually occurs 36 hours after this trigger injection is given. In the case of IVF, egg retrieval is carefully timed to collect the eggs just before ovulation, but long enough that the eggs have matured in the body ready to be extracted for fertilisation. In part 3 I will focus on explaining the second phase of the menstrual cycle which includes the lovely hormones estrogen and progesterone….yippeeee!!! …ok, perhaps not so much of a huge success, the drugs ending up inside Dani is a success but the number of attempts to get the needle through the skin left some room for improvement. Day 3 summary: Injections 2 : Holes in skin 3 – oh dear. A slight backward step here, the first attempt bounced, yes really, it bounced off her stomach, but worry not, I got it on the rebound. The double shot made me a little nervous on the second injection but afterwards Dani patted me on the head whilst saying ‘well done’ so I know it went well. I also wonder if she thinks I am a dog, It gives me something to ponder as she scratches behind my ears …. Final result Injections – 3 : holes in skin – 3, another stellar performance by Dani, she took the needles like a pro. The morning jab went OK but the drugs seem to burn after they’re inside her and that didn’t give a good start for the evening drugs as there was some nervousness about the pain from the Menopur., Fortunately the kneeling seems to make it steadier when I draw the needle out so less pain from the injections and only discomfort from the drugs. There was no real need to lie down this time but we did it anyway as it’s just a nice thing to do. Not the best of records, and although it pains me to say it, I have to recognise that I’ll never close the gap. The only way to close the gap is to give two injections in the same hole, not something we will be attempting at any point (pun intended – thank you!). The 4 hole difference in my stats will forever be there, a record of my ineptitude and an indicator that a career as a nurse might not be a good option for me. The best I can hope for is that Dani forgives me for being so rubbish with the needles and that the gap between # injections and # holes doesn’t widen any further. 5 days to go. Would anyone care to bet what the final stats will be … ? Today was injection day number 1 and the number of injections required was 2. 2 injections means 2 holes in the skin. So today Dani and I started the injections for IVF. We have previously done 3 injections for IUI and so have had a limited amount of practice. The nurse took us through all the steps for mixing the drugs and it seemed fairly straight forward. So when it came time to do the first injection Dani pinched an area of her tummy and I moved in, needle in hand. We do a count down so Dani knows when the needle goes in, only, on this occasion the needle did not go in. At this point I had started to worry that I’d somehow blunted the needle whilst extracting the drugs from the vial. I was also worried that that I was wasting some VERY expensive drugs by not getting them inside her. Two more attempts and the needle still didn’t go through Dani’s skin. I was getting really worried at this point, the needle was making tiny pricks that bled but wouldn’t go all the way through the skin. Each time I tried to do the injection I knew it was hurting Dani, small spots of blood formed on her stomach. This was the lowest point of the entire process for me, I’m not sure how Dani kept so calm, she is perhaps even more scared of needles as I am. Dani is AMAZING! We looked at the instructions again and decided we’d done everything right with the mixing and the syringe filling, it appears that I just needed to push harder. So with 3 holes in her tummy already we pinched the skin again and I prepared to inject harder. In reality I probably didn’t have to push very hard but in the moment it felt like I was trying to jab the needle through her entire body. I used the ‘dart’ method, holding the syringe like a dart and jabbing it hard at the skin. This time the needle went in smoothly all the way to the ‘stopper’, the drugs were injected and the needle came out smoothly without a single drop of blood. We disposed of the needle, tidied the mess and then we both went to lie down for a minute. I was feeling light headed and a little sick … how daft is that? Dani is the one being stabbed and having reasonable quantities of drugs pushed into her body and yet I’m the one lying down feeling woozy. I really cannot say how much I admire and love her, she is going through so much and yet still finds a way to comfort me. What an amazing girl. After a couple of minutes snuggled together, skeptically examining the collection of puncture marks on her tummy from the first injection, we prepared for the second injection. This time things went much better. I prepped the syringe and Dani lay propped up in bed, a patch of tummy swabbed and ready. On the count of three I launched the syringe towards her with such force the skin stood no chance, parting under the extreme pressure of the assault Dani’s tummy had no choice but to accept the drugs. 10 seconds in and out and it was all over. 2 injections, 5 holes in the skin. Not a good ratio considering we have 70(ish) more injections to go, but I’m confident we’ll get better at this – hopefully by tomorrow! There isn’t much I have purchased in life that I have not been allowed to return, with the exception of swim wear, knickers, sale items and earrings. But today I purchased enough medication for our first IVF cycle….and it comes with a big fat no returns policy! There is no turning back now. The whole order cost us $770 (which is the co-pay at 10%, so complete cost of the medication is $7700!! Ouch.) and should arrive in a couple of days. I guess we are really doing this then….